SADLY THESE COMRADES WILL NO LONGER BE AMONG US, THEY HAVE CROSSED OVER TO JOIN THAT GREAT ARMY WHOSE FOOTFALLS ARE NOT HEARD. Richard was born on April 2, 1930 and passed away on 15 December 2017. He graduated from Eastern Christian School in Paterson, New Jersey in 1948. He enlisted in the United States Air Force in 1952, and served in the Korean War until his honorable discharge in 1956; at this time, he returned home to care for his widowed mother. Richard Andrew Kmetz Viewing: N/A December 20, 2017 (Wednesday) at 11:00 A.M. Good Shepherd Lutheran Church Richard Andrew Kmetz was born on April 2, 1930 in Garfield, New Jersey. A memorial service with military honors will be held at Good Shepherd Lutheran Church in Gaithersburg, MD on Wednesday December 20th at 11 am. In lieu of flowers contributions may be made in his name to The American Legion, Gaithersburg, MD. Frederick passed away on Friday, January 27, 2012. Frederick was a resident of Gaithersburg, Maryland at the time of his passing. He was preceded in death by his wife Joy. It with great sadness that I have to report that Bartolo "Ben" Trimboli transferred to Post Everlasting on April 13, 2012. Bart had recently celebrated his 104th birthday on March 15th. While at home he had fallen, and was transferred to the hospital. On Friday morning he was active and talking, the situation changed quickly in the afternoon when the staff found him unresponsive. Bart was an Honorary Life Member of American Legion Post 295 and had 63 years of membership. In addition, he was a Life member of VFW Post 8031 of New Hyde Park, NY and Disabled American Veterans Chapter NY 209. Bart served in the United States Army during World War II as a member of the 82nd Airborne's 325th Glider Infantry Regiment and participated in the invasion of Normandy on June 6, 1944. Pvt Trimboli was awarded the Purple Heart, Good Conduct Medal, Prisoner of War Medal and the European-African-Middle Eastern Campaign Medal with 3 Campaign Stars. During the assault on D-Day, most of the squad in Pvt Trimboli's glider were killed on landing. He survived and rejoined his unit to continue the assault on Ste. Mer Eglise. He was wounded on June 9th and upon reaching a good fighting position he was wounded in the leg with frag and was taken prisoner. He was held for 26 days. RUDOLPH JOHN WAGNER, JR. "Rudy" On Monday, August 10, 2009, of Germantown, MD. Beloved husband of Phyllis Wagner; loving father of Rudolph J. Wagner, IV, Michael D. Wagner, Tammy R. Wagner and Ronald H. Martin, Jr.; brother of Martina Walton, Joseph Wagner, Nora Stebner and Mary Biliski. Also survived by three grandchildren, Michael D. Wagner, Jr., Jacob M. Martin and Christopher R. Martin. Friends may call at DeVOL FUNERAL HOME, 10 E. Deer Park Dr., Gaithersburg, MD on Thursday from 6 to 8 p.m., where service will be held on Friday, August 14 at 11 a.m. Interment Arlington National Cemetery on Thursday, October 1 at 1 p.m. Family and friends should assemble at the Administration Building at 12:30 p.m. In lieu of flowers, contributions may be made in his name to Montgomery Hospice, 1355 Piccard Dr., Suite 100, Rockville, MD 20850. Gene was born in Minnesota, but lived in Superior for 37 years. He and his wife Shirley were childhood sweethearts, and married on St. Patrick’s Day, 1945. He learned his strong work ethics when he was young with a printing business and a delivery business that he ran with his Harley with sidecar. He enlisted in the Navy in 1942 to become an F6F Hellcat carrier pilot until the end of the war. His love of flying took him to the Air Force Reserve as an F94 pilot and a summertime crop dusting pilot in Montana. During those post war years in Superior, he also worked with the Chicago Northwestern RR as a switchman. In 1959 Gene became an air traffic controller in the Oakland Center, and in 1962 at Fort Ord. When he retired in 1984 he dove into his life-long interest of lapidary and rock hounding, becoming a very active lifetime member of the Monterey Bay Mineral Society. In 2002 Gene and Shirley moved to Fresno to be closer to family. Gene was loved and respected by his children, grandchildren and those who knew him for setting an example of helpfulness, hard work and ethical behavior. He will be missed, talked about and thought of often with fond memories. He is survived by his wife of 65, Shirley A.; sons Skip and his wife Jackie, Steve and his wife Anne, Chris and his wife Shirley M.; and his daughter Sue Hedman and her husband Bill. Gene is also survived by three grandchildren, three great-grandchildren, three step grandchildren, and four step-great-grandchildren and his niece Cathy Ouellette and Becky Kuhn of Poolesville, MD. Gene was a member of American Legion Post 295. JONES LUCIEN B. JONES "Lucky" On Friday, April 9, 2010, of Germantown, MD. Beloved husband of Iva Jones; father of Gary Lee and the late Craig A. Jones. Also survived by two grandsons; two granddaughters and five great-grandchildren. Relatives and friends may call at Collins Funeral Home, 500 University Boulevard, West, Silver Spring, MD, (Valet Parking), Thursday, April 15 from 2 to 4 and 7 to 9 p.m. where a Funeral Service will be held on Friday, April 16, at 11 a.m. Interment Fort Lincoln Cemetery. Mr. William Edward Dunford, 88, of Frederick, formerly of Rockville and Cabin John, died on Monday night, July 25, 2005, at Country Meadows of Frederick, his residence for the past 17 months. He was the husband of the late Alice A. Fletcher Dunford, his wife of 61 years who died on January 15, 1996. Born in Campbell County, Va., he was a son of the late Edward B. and Hazel Glass Dunford. Mr Dunford was a World War II era Veteran and a 17 year member of the American Legion Post 295. For many years Mr. Dunford worked as a machinist for the David Taylor Model Basin, Washington, D.C. After retirement from the federal government, he was a representative of the Bechdon Company and worked for Free State Cycle in Bladensburg. He was a motorcycle racing enthusiast. Consequently, he was a lifetime member and official for the American Motorcycle Association. Mr. Dunford and his wife Alice loved to travel. They had visited all 50 states and Europe, returning home to Crestwood Village, Frederick. He was a devoted father and grandfather who was always there when his family needed him. LAWSON, CHARLES A., II, 72, a 40-year resident of Linthicum, went home to be with the Lord on January 23, 2010, after a battle with frontotemporal dementia. Charlie was born October 2, 1937, in Gary, Indiana. He graduated from Emerson High School in 1955. Charlie joined the Navy in June 1955, and served on the USS Abbot (DD-629) as a fire control technician. 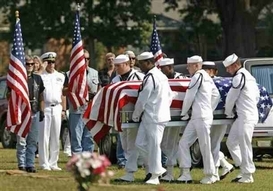 His highest rank was FTG2, 2nd class petty officer. He went to Purdue University for electrical engineering and graduated in 1963. He worked for Westinghouse/Northrop Grumman for 36 years and worked on the F-4 Phantom II jet, AWACS radar system, B1 Bomber and nuclear power plants. He received two patents. Charlie also went to Vietnam in June 1966 for 10 months as a Westinghouse engineer to assist the Marines in the maintenance of the radar in their jets. Charlie was active at Linthicum Baptist Church for 30 years as a deacon, chairman of the deacons, adult Sunday school teacher, Sunday School Director, Outreach Director and Children's Church teacher. He also went on two mission trips to Prince Edward Island, Canada. Charlie was licensed as a preacher in 2000. He was involved in other Christian work outside the church. He was 1st vice president of the Southern Baptist Convention of MD/DE in 1995, a trustee at Southwestern Baptist Theological Seminary for 10 years, a board member of the Inner Harbor Ministry, and a speaker at the Helping Up Mission in Baltimore for 25 years. Charlie was a volunteer at the Billy Graham Telephone Ministry for 26 years and was a counselor and participated in other volunteer capacities in Baltimore for the Billy Graham Crusade and the Franklin Graham Festival. Nationally, he was involved with the Southern Baptist Convention and served on the executive committee. He also introduced the need to add a section about 'the family' to the Baptist Faith and Message Statement; it was adopted in 2000. Charlie was a loving husband, father and grandfather. He is survived by his wife of 47 ½ years, Marcella DeMoulin Lawson; his children, Deborah Guidry (Jim) of Crofton and Charles Lawson, III, (Rebecca) of Marriottsville; three granddaughters and one brother, Fred Lawson. He was predeceased by one brother, Larry Lawson. Charlie enjoyed reading, traveling, sports, computers, carpentry and mission work. , 77, of Gaithersburg, died May 13, 2012. Born June 5, 1934, in Van Buren, N.Y., he is survived by Donna Aller, his wife of 36 years. He served in the Marine Corps during the Korean War Era. He worked for many years overseas in Turkey, Greece, Germany, Iran and Africa for various communications companies. His last full-time employment was with GE at their GEIS facility in Rockville. He started his own tennis instruction business and coached softball overseas for the Rockville GE team. He also was a professional photographer and was published in several photography magazines as well as Montgomery Village Foundation calendars. He was a board member and chief photographer for the annual Frederick Air shows. In addition to his wife, he is survived by his son, Jake Maddox and wife, Tina, of McDonough, Ga.; his siblings, Lynwood Aller of Phoenix, N.Y., Helen Aller of Baldwinsville, N.Y., Sue Abare of Granby, N.Y., Cyndy Lupton of Phoenix, N.Y., June Benoit of Hannibal N.Y., Willard Aller of New Smyrna Beach, Fla., and seven grandchildren. Erskine E. “Ski” Aller, 77, of Gaithersburg, died May 13, 2012. Born June 5, 1934, in Van Buren, N.Y., he is survived by Donna Aller, his wife of 36 years.